One amazing country – two magnificent wildlife powerhouses. Which one is best to visit? Wildlife-enthusiasts looking for an exceptional journey in Brazil will undoubtedly come to the same decision crossroads: should they visit the largest rainforest on earth…or the largest wetlands? Whilst the Amazon Rainforest may be the most famous and celebrated wildlife-watching destination in Brazil, the Pantanal is, by far, its best hidden-secret. Even the National Geographic thinks so. Both these destinations are renowned for boasting a mind-boggling wildlife diversity although each one is incredibly unique which means that a visitor’s experience of actually seeing the wildlife is altogether different. In inner travel-circles, the Amazon VS Pantanal rivalry (to be named Brazil’s wildlife-watching KING) has been brewing for years yet as popularity for the latter continues to garner momentum, we thought we’d virtually guide you through Brazil’s top two wilderness highlights so you can better understand what makes them so incredible and, primarily, what differentiates them. South America’s most famous wilderness highlight needs very little introduction but for the sake of reviewing we’ll just WOW you with a few interesting facts. The Amazon Rainforest is one of the most spectacular wonders on earth: this is the world’s most important environmental treasure, home to its longest river (which flows for 6400km) and over 1000 pivotal tributaries. In its lush and thick vegetation thrive over 40,000 distinct species of flora (the base plants for many modern medicines) and thousands of unique creatures, including more than 400 mammals, 1,300 birds, 430 amphibians, thousands of marine species and millions of insects. On paper, the Amazon reigns supreme when it comes to wildlife, above and beyond any other place on earth. Yes, including the Pantanal. The Amazon is 28 times the size of the Pantanal and home to about twice as many species of wildlife. Yet when it comes to wildlife-watching adventures, however, it’s the Amazon that should be considered the real hidden treasure. Wildlife-watching value- The sheer gargantuan size of the Amazon and its immensely thick vegetation means that although the rainforest is home to such a glorious amount of wildlife, seeing it is a lot more difficult than you might imagine and certainly very difficult without a knowledgeable and expert Amazon guide at hand. These guys can spot sloths and monkeys where you and I only see trees, they can detect animal calls, know what they are, and track them. As they continually tour their respective section of the forest, they know the best places to see what and when and are absolutely crucial to a rewarding journey. The Amazon offers, hands-down, the most astounding tropical jungle experience in South America, and even the entire world, but wildlife watching here can be hard work, especially during the flooding season. 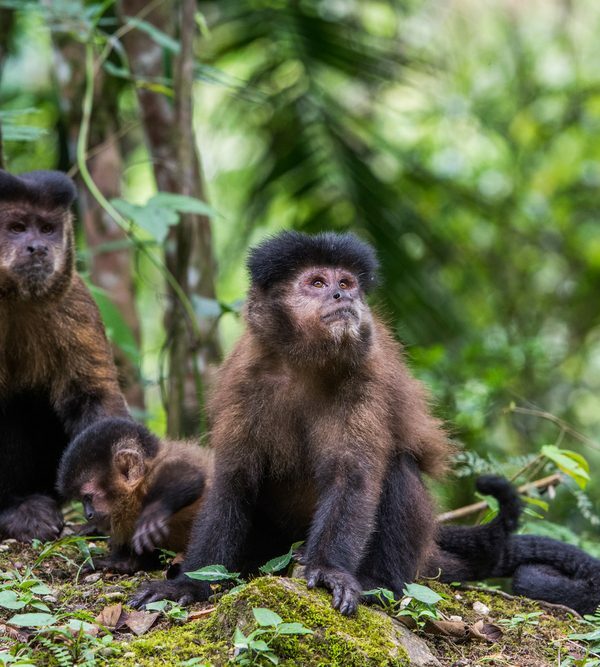 There are a few special spots that are always home to certain species – be it river dolphins or piranhas – and you’ll (hopefully) also see plenty of monkeys, sloths, toucans, caimans and various other birds. But you will have to go out looking for them all. Contrary to what you may think, the Amazon is not the kind of place where the wildlife just jumps out at you. Visiting the Amazon- Being so expansive means the Amazon is accessible from various countries, not only Brazil. 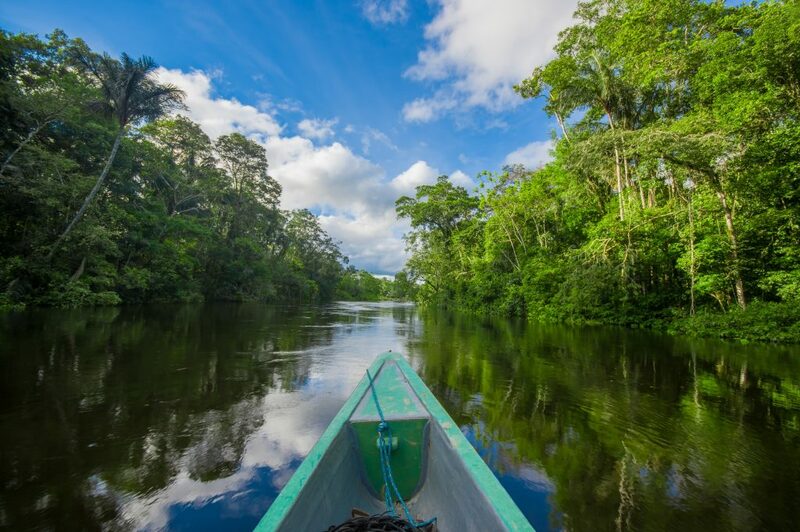 Amazon journeys can also be taken in Ecuador, Peru and Bolivia, each country offering superb springboards to explore a distinct section of this most incredible rainforest. In Brazil, the main access point is the town of Manaus (which is a 4hr-flight away from Rio de Janeiro) and, from here, you’ll need to travel on bumpy roads for quite some time to reach your chosen lodge. At times, transfers by road can take a few hours. The unique Amazon pros- Sections of the Amazon boast some impressive infrastructure and here you can find luxury eco-lodges and chances for stunning luxury cruises along the Amazon River. Travelling to a tropical jungle with creature comforts (like air-conditioning and insect screens on windows) is a truly underrated luxury, especially aimed at those who were scared off when we mentioned that the Amazon is “home to millions of insects”. Read our guide to the Best Time to Visit the Amazon to learn why travelling here during the dry season increases your chances of spotting wildlife. If you’re a keen observer you’d have noted that considering the Pantanal is 28 times smaller than the Amazon, and home to half the amount of species, that actually speaks volumes for its wildlife-watching value. 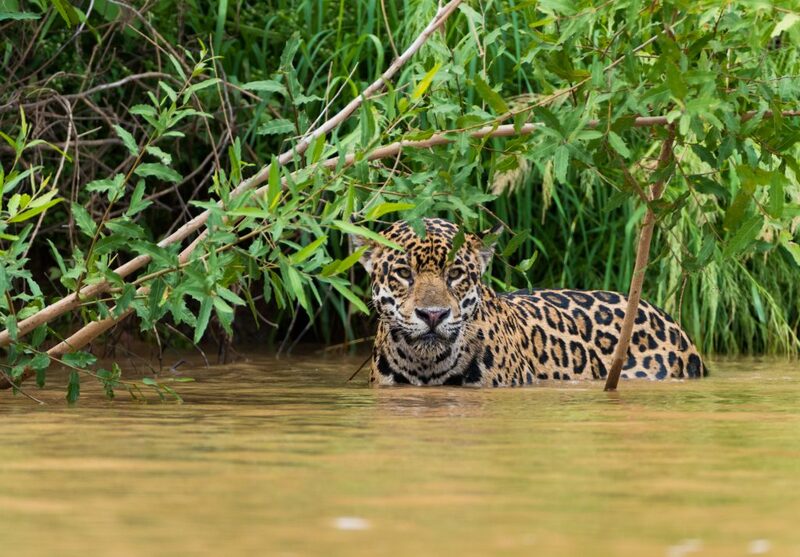 The concentration of creatures in the Pantanal is magnificent and so are your chances of seeing it. Wildlife watching value- The largest wetland system on the planet, the Pantanal is still very impressive in size, about half the size of continental France. Lacking major thick vegetation, however, means that here your eyes see to the horizon and the animals, all those glorious creatures, are out in the open and easily spotted. The Pantanal is to Brazil what the Kruger National Park is to South Africa: the country’s most rewarding destination if what you want to see, above anything else, is an abundance of wildlife. In the Pantanal you can travel by boat, by 4WD, on foot and even on horseback, all the while dodging unique creatures soaking the sun’s rays. You can sit enjoying a sundowner at your lodge on the shores of a river at sunset and witness a wildlife-parade right in front of your eyes. 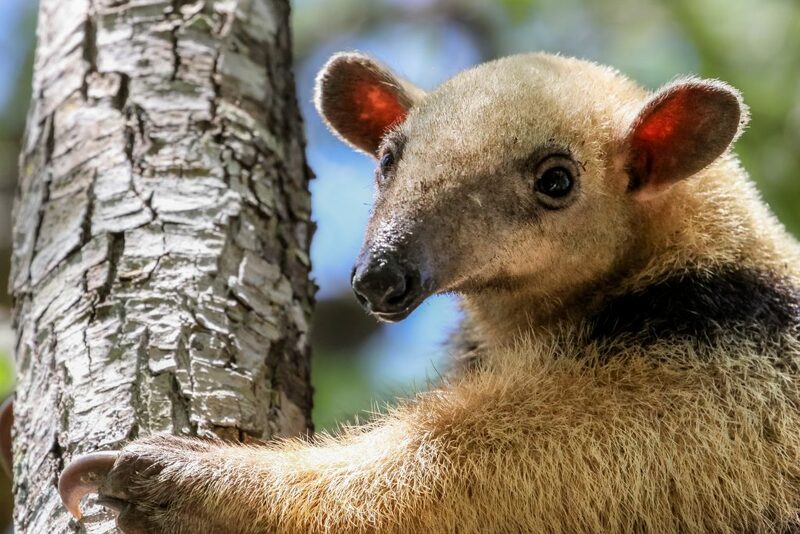 Travel to the Pantanal and you’ll see jaguars, capybaras, giant otters and giant anteaters going about their day; nut-cracking Capuchin monkeys working for their feed and Hyacinth Macaws munching on seeds on the ground as if you don’t even exist. This is a bird-lover’s paradise and a wildlife-watching haven that’s continually rated as the best in all of South America. Visiting the Pantanal- There are two access points into the Pantanal: Campo Grande in the south and Cuiaba in the north. Only a couple of hours’ flight from Sao Paulo, the Pantanal is home to various lodges which offer a wealth of excursions by various means so you can be a lot more active here than in the Amazon. Given the exceptional wildlife-watching value of the Pantanal, it’s advisable to just pick one lodge to act as a base point and take excursions from there, rather than waste time transferring from one lodge to the next. Read our Pantanal Guide for more info you’ll find useful. The unique Pantanal pros- The Pantanal is genially located close to Bonito, Brazil’s premier eco-tourism destination, home to the most pristine rivers on earth and a hub for active adventurers. Combining the two destinations offers a comprehensive wilderness experience that’s simply unreal. Moreover, the Pantanal may be more suitable to those who aren’t overly active and don’t wish to trudge through hours-long jungle hikes. It may appear that we’ll throw in a blanket verdict to say the Pantanal is the clear winner of the Amazon VS Pantanal wildlife-watching battle…yet not all is as it appears. The way we see it, wildlife-watching isn’t just about seeing animals. If that were the case, we could all just go to the zoo and get just as much enjoyment out of the experience. But we don’t, for a very specific reason: there is nothing more exhilarating and almost life-changing than going out of our way and working hard to spot a stunningly unique creature in its natural habitat. So whilst the Amazon may seem to deliver less when it comes to watching wildlife, it still offers an unrivalled nature-drenched experience, one that you won’t find anywhere else on earth. The Amazon is still overwhelming, incredibly so, and awe-inspiring to the max. This incredible rainforest, the lung of our planet, is a must-experience for anyone who loves nature in its extreme. Heading off of a morning, donning gumboots and a bandana (to keep the sweat from getting in your eyes) a pair of binoculars in one hand and a camera in the other, makes one feel like an old-world explorer; an avid adventurer heading off into the unknown in search of fantastical creatures. Yes, the Pantanal may offer wildlife as if it’s served on a silver platter but the Amazon is the silver platter, handmade and utterly irreplaceable. Both the Amazon and the Pantanal offer once-in-a-lifetime travel experiences and we hope that knowing more about them, and more about what to expect, will make your decision easier and your eventual journey all the more rewarding. At Chimu Adventures, we are your Latin America travel specialists: we’ve been to the Amazon and the Pantanal (several times over), on our own, with our parents and with our kids. We have extensive experience travelling to both regions of Brazil and, because we’re great at what we do (even if we do say so ourselves) know how to best combine a trip to the Amazon or Pantanal with other sensational destinations. So why not give us a call? We’ll help you plan your own unforgettable journey to Brazil. Amazon – Lodge or River Cruise?